A very quick visit to Druridge after work, it was quite cold, the strengthening north-easterly making is feel even colder, maybe the cloud of volcanic ash that has grounded all of the planes today was blocking out the sun? Highlight of the visit was a whimbrel flying north, calling, my first of 2010 - nice to here them back! I think of all the waders we see here regularly whimbrel have the best call. Apart from the odd one, all of the wigeon have gone from Druridge now and have been for a couple of weeks, I happened to drive past Bradford Kaims pond near Bamburgh today and wigeon were the numerous duck there... There were eight on the sea this evening and five red-breasted mergansers. Now, regular readers of this blog will know that Druridge attracts its fair share of odd characters, not just the birders, but all kinds of deviants and it is good to know that nothing changes. 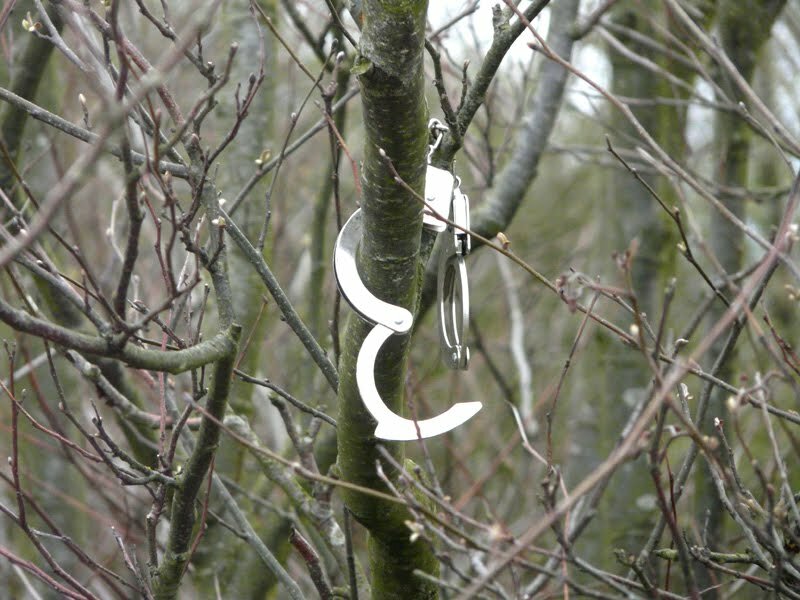 Driving out tonight, I noticed something in the bushes, closer inspection revealed it to be a pair of handcuffs! Worth a photo I thought, when I got closer, I noticed, in the same tree, there was an electric drill.....draw your own conclusions! The moth trap in the garden is producing a few hebrew characters and little else, one moth from this morning remains unidentified. A drill and a pair of cuffs? Perhaps someone wanted to be a bit restrained. Get it? Drill bit! A bit restrained. Comic genius! Who said Scouse humour was dead?